At an awards ceremony in Rethymno, Crete, Greece on March 12, winners of the 3rd Cretan Olive Oil Competition were announced. Intended to highlight the quality of Cretan extra virgin olive oils, this third edition of the competition impressed commentators for several reasons, including better quality olive oil, more samples, and a higher percentage of organic olive oils submitted compared to previous years. 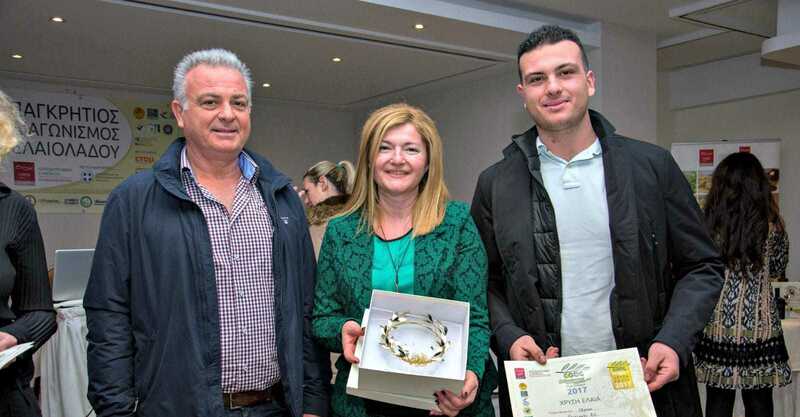 The winners for organic extra virgin olive oils (EVOOs) were Kardia Food’s Diva and Cretan Mill’s Agrelia Organic, tied for gold; Latzimas’s Latzimas Bio, with silver; and in a tie for bronze, Kostas Kalligiannis’s Zero One Premium and Nutricreta’s Organic Oleum of Sitia. The winning conventional EVOOs were Botzakis (Creta Oil) Olyssos, capturing the gold; Terra di Sitia’s Thema Extra Virgin Olive Oil, winning silver; and in a three-way tie for bronze, Eftychis Androulakis’s Pamako Blend Mountain EVOO, Cretan Mill’s PDO Sitia, and Psarakis’ Harvest EVOO. Although the plan was to award just one gold, one silver, and one bronze “Elea” (meaning “olive”) award for the best conventional EVOOs and one of each for the best organic EVOOs, several extra awards were presented because of a number of identical scores. There were so many close high scores that honorable mentions were also awarded, reflecting the judges’ opinion that an impressive number of high-quality Cretan EVOOs were submitted, even in this difficult harvest year. Cretan Mill’s Maria Foule, who took home a Gold Elea for the Almpantakis family’s organic EVOO and a bronze for their conventional EVOO, told Olive Oil Times, “We’ve been in olive oil production for 150 years. We’re a family business. We put love, passion, and soul into what we do. We believe in competitions; they help us show what we do and what we love.” They export their EVOOs all over the world. All but two of the top ten winners at this Cretan competition were monovarietal Koroneiki EVOOs. Kardia Food’s gold-awarded Diva is a monovarietal Tsounati, while Androulakis’s bronze-winning Pamako Blend Mountain EVOO combines Koroneiki and Tsounati olives. Androulakis, whose organic Pamako Monovarietal Mountain EVOO, an honorable mention and close contender for a bronze, is also a monovarietal Tsounati, told Olive Oil Times, “finally, all my efforts to raise Tsounati from the dead are rewarded.” To make a great olive oil took him 40 nights with very little sleep, four years of efforts, and 42 experiments with temperatures, malaxation, crushing, decanter speeds, 2 olive mills, and 3 different inert gasses. Effie Christopoulou is a panel supervisor and recognized chemical and organoleptic trainer of the IOC as well as a chemical expert for the EU and the IOC. One of the pioneers of the organoleptic method back in 1982, she told the audience about the competition’s methodology and compared this year’s samples with those from the last two years. Christopoulou was pleased to report that there had been an increase from 69 to 81 samples submitted from 2015 to this year and a marked improvement in the percentage of samples with a grade of at least 65, from 84.1 percent in 2015 to 98.8 percent this year. Now, she added, it is necessary to take measures for Greek EVOOs to become better known in international competitions. Before awards were presented, the mayor of Rethymno and the governor of Crete commented on the importance of Cretan olive oil as an export that is recognized worldwide. Manolis Chnaris, president of the competition’s main sponsor, the Agronutritional Cooperation of the Region of Crete, called olive oil the “most important product on the island” and emphasized the importance of standardizing more Cretan olive oil to give it “a strong identity” so it would be more competitive in the international market, rather than being sold anonymously in bulk. Judge Philipp Notter said he was “proud to be here because in Crete you are in the history of olive oil – at the roots,” and “I respect the roots.” Kardia Food’s Babis Doukakis told Olive Oil Times that his company intends to continue infusing their olive oil “with a breath of our own spirit, creating a vision of Crete the world joyously shares. It is our love for Crete that brings us here,” to win a Gold Elea at the 3rd Cretan Olive Oil Competition.